The BG’s should be reopening again shortly. Please make sure to post in the exiting issue threads in the BG’s forum should you continue to encounter problems. We’ll be monitoring them on our end as well. We talked about this idea early on in battlegrounds development but our thoughts were that you’d want to stay connected with your existing guild and friends as much as possible. Due to the communication restrictions between the worlds, if the Battlegrounds world were more of a destination, people would seem even more cutoff from the rest of the game. However, I’m encouraged by the fact that all of these responses seem positive to the idea and not any negative reactions. But for this to work, we would have to solve many of the communications issues and do a lot more cleanup on the BG world. We are working on ways to improve the zoning times when you move between the worlds so hopefully that will make zoning faster. We also have plans to try to open up guild chat and some other forms of communication between the worlds but there isn’t an ETA on that yet. Battlegrounds were taken offline last night due to zoning problems they seemed to be causing on other servers. I want to reiterate that in thousands of Battlegrounds transactions, only a handful of players experienced corruption of their characters, and those are being resolved quickly by Customer Service. Battlegrounds should be brought back online today with Rothgar and other devs closely watching their performance. EQ2Wire will be on the road today and tomorrow so updates may be a bit slower than usual. Battlegrounds were locked this afternoon/evening due to significant lag and zone time issues. The servers were also rebooted. However the biggest issue is that Oasis is almost unplayable for some players. We’re aware of the problems facing the Oasis server right now and several people are working on it. It will be addressed more fully tomorrow when everyone is back in the office and I’m sure we’ll have more information then. There is an active thread on the Oasis server forum. A few players are reporting sporadic issues with losing AAs, levels, gear, etc. after lagging out from playing in Battlegrounds. I and others have played Battlegrounds and not had issues, so this seems pretty random issue. Sometimes, I did have a 5-10 minute wait leaving the Battleground and being sent back to my home server, but saw no other issues. When I started using the EQ2 Forums I remember how intolerant the moderators were towards differing opinions and constructive criticism. Any kind of useful feedback was deleted and members banned for expressing themselves. I just plain stopped posting there. I, along with thousands of other players, moved to EQ2Flames. 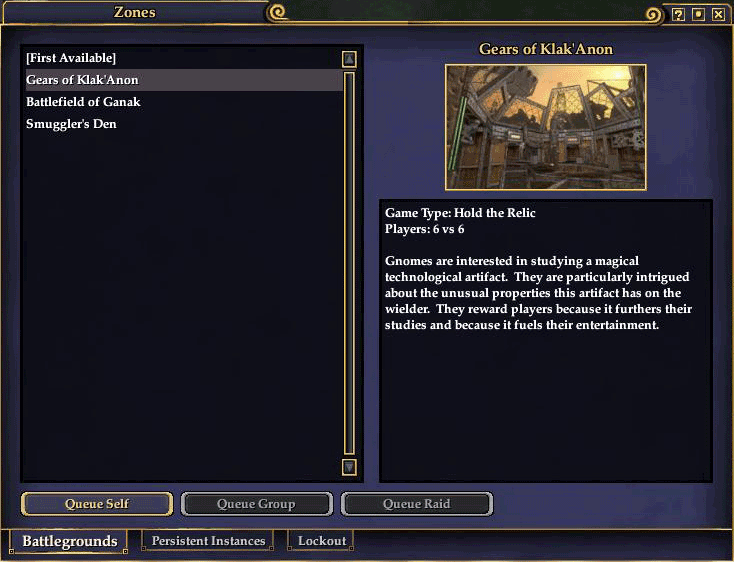 It is only under Kiara‘s guidance that the EQ2 forums clawed their way back to being a place where constructive criticism is allowed and players are truthful about their favorite parts as well as the major issues within EQ2. She has fought at every turn to allow players to speak their mind. Do I think Kiara is perfect? Of course not. Nobody is. But in my 9 years experience in moderating 2 other forums, I think she’s doing a damn good job. And yet, in the past couple of months, I have noticed unbelievable hostility towards her, blaming her for EQ2 development choices, database issues, expansion launch pains, etc. I see people shooting off at the mouth about things they don’t even understand. But what has really turned my stomach is when I heard about players gloating to their friends that they reported her to her supervisor. But really, if someone out there is too chickenshit to resolve their issues with Kiara, why don’t you send *me* a mail here on EQ2Wire. You might learn something. Customer Service has made these petitions their highest priority and they are restoring players as fast as they can. In the meantime, Battlegrounds is working fine now. It only took a few minutes this morning to bring them down after the problem, fix the configs and bring them back up. CS is also manually restoring your XP and AA’s rather than doing a rollback of your character. So you should be safe to continue playing while you wait for them to answer your petition. EU servers are now up. The BG’s have not been enabled for any of the international servers, due to the database issue. We’ll let you know when they will be available. Thank you for your patience today, we appreciate it. There will be no server-wide rollback. This problem affected about 200 users and rolling each back individually will be much less intrusive than taking down every world and rolling back all of their databases. Please be sure to petition if you lost AA or XP due to battlegrounds. The issue with AA’s being reset seems to be a server configuration error. We have locked the battlegrounds world to keep new matches from starting up while we fix the configuration. We will have more information very soon about how to proceed if you’re missing some AA after coming back. Alternate Advancement (AA) points are being reset to 200 points. Any percentage gain over your level (for example level 88 with 90% to level 89) is lost. AA trees are completely reset. Macros that use AA-derived spells do not work on Battlegrounds. At this point, we are advising players to NOT touch Battlegrounds until they are fixed. US Servers are unlocked and Battlegrounds are now live. EU Servers still have approximately 1 hour of downtime remaining. Here are your Hotfix Notes for February 25th, after the jump.. According to Brenlo on his Twitter, work continues on getting Battlegrounds up today. This is resulting in a longer than expected downtime. Maintenance is running a little long. We are working on some network settings for the Battlegrounds. We are restarting the servers and expect to have everything up and running about 10am PST. Battlegrounds are now enabled on Test and Test Copy. Battlegrounds have slipped again to February 25th. 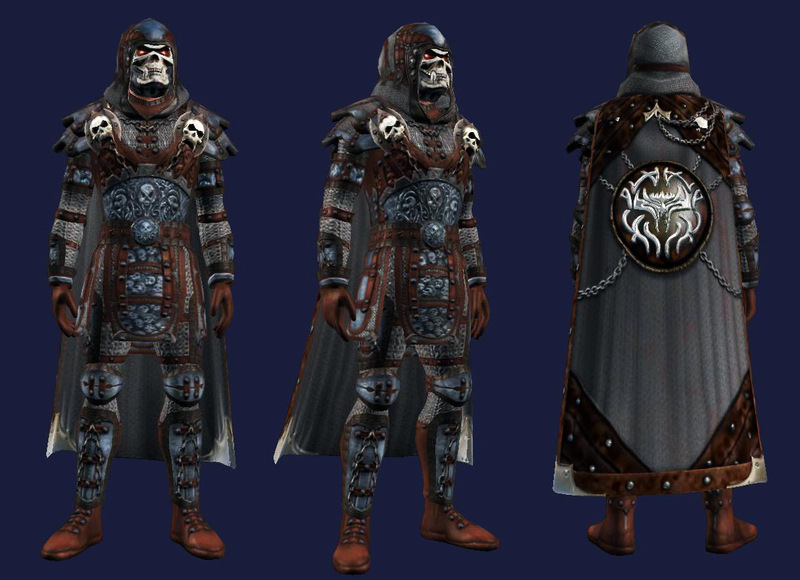 From the EQ2 Forums. Since we’ve stated in this thread that the Battlegrounds feature is launching on the 23rd with the digital launch, I’m updating here to say that we’re actually going to be pushing it back a few days to put a few extra anti-cheating measures in place. The plan is for Thursday the 25th If there are any other updates, we’ll let you know! The EQ2 Developers are looking for players to help load test the Battlegrounds over on Test Copy before putting them on live servers on the 23rd. Join developers in playtesting Battlegrounds at 2pm PST today, Friday Feb 19th. We have received word that Battlegrounds have been delayed until February 23rd. Here we are, perched on the precipice of another big launch for our beloved game, EQII. Next week is a big week for us and for you, the players of this grand game. You will finally be able to log into the new areas of Odus and explore, level and play in the new area that the team has spent nearly a year putting together. Characters can now advance to level 90 as adventurers and tradeskillers. More items, more spells, more AA’s and we hope lots more fun. As many have noticed, Halas is not going out with the expansion, many have asked why and the reasoning is twofold. We have three pretty decent starting areas already. Darklight, Greater Faydark and Timorous Deep. We know they are not perfect and so the team has done considerable work in reworking those areas, streamlining the progress path to make for a better experience. We believe that you will find the experience in those zones to be far better than it had been. So, we went to work on higher level content for this launch, which we have with the expansion content and the new Battlegrounds. Additionally we really want new Halas to be something special. We want more time to polish the area and make sure the progression path is fun and smooth. We also hope to get kilts in there. Currently we are looking to have Halas out with the Halas Reborn update later in the year. 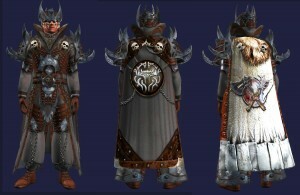 With this release, we are proud to open up the Pre-Season of EQII Battlegrounds. Three zones will be available, each with a different playstyle. They will have progression and items and we hope add a whole new element of fun to the game. Unfortunately we didn’t quite get as many players as we had hoped on the server to give it a proper test, so we are going to use this pre-season phase to iron out any kinks and tweak the balance a bit more beyond the testing phase. When we are ready, we will begin Season 1 and the mayhem will begin in earnest. 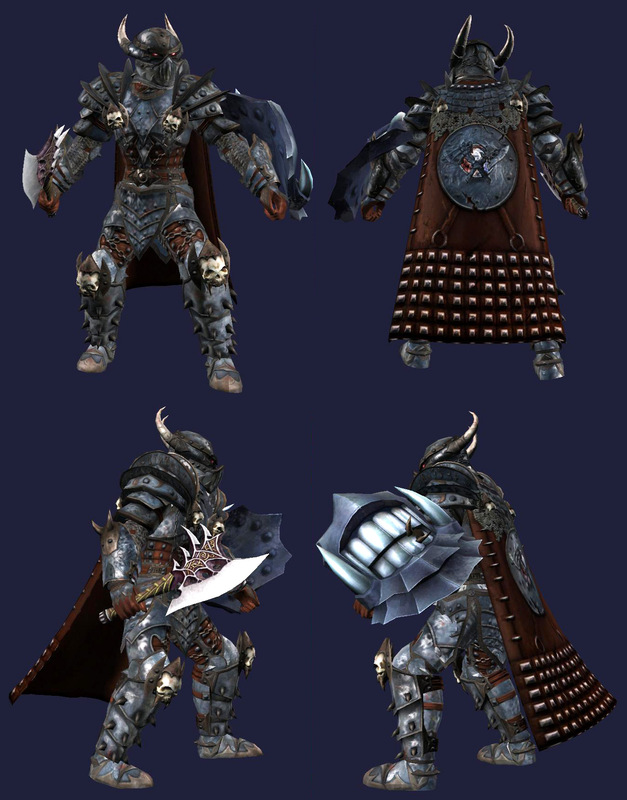 You will be able to work towards the new Chaos Armor during the pre-season, which might be the best looking armor we have added to the game. With a game like EQII, it is evergrowing and everchanging, on occasion we find the need to adjust items, spells etc. . . and some mythicals had their power reduced with the release of the expansion. With each launch, we have to look at the items released previously and decide if they are perhaps too high to encourage players to look for upgrades. EQII is, at its core, a game driven by itemization. The constant desire to get the next biggest, baddest piece of gear. So on occasion we have to make some difficult decisions. This was one of them. For those who feel their mythical was devalued, I offer my apologies. Next Tuesday is the retail head start, so to get you all ready, we are turning on Bonus XP from now until the servers come down for the update Tuesday morning. I hope you all login and enjoy. We look forward to seeing you on the Battlegrounds and running around Odus. Mostly, we thank you for playing EQII. 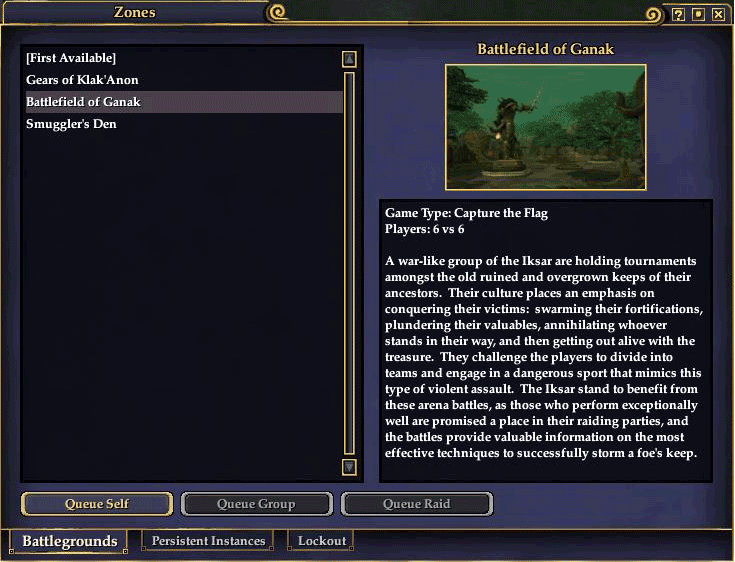 In response to concerns that 6 vs. 6 is too few players to set up an adequate defense in the Battlefield of Ganak: Capture the Flag Battlegrounds scenario, the number of players is being changed to 12 vs. 12. This should also hopefully address the issues of spawn camping (AoE root/nuke players as soon as they revive). as a defense perimeter can be setup to protect your allies. Justin did a fantastic job on this Battlegrounds video and it’s one of the better EQ2 promos I’ve seen. You may remember he also did the stunning GU54: Will of a Tyrant video (Download in HD) which got a lot of positive comments on different forums. It’s nice to see promotional materials that do a great job selling the game. Hopefully we’ll see more like this! Ok I promise we are not renaming this site to EQ2BattlegroundsWire. 😉 We’ve had a lot of news about them lately, but we will be getting back into the PvE side of things with Grouping and Raiding very soon! 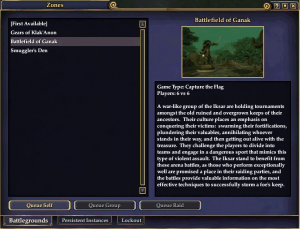 There has been some talk on the EQ2 Forums both in PvP circles and elsewhere, in the Beta forums, not to mention EQ2 Flames, with a lot of concerns about how fairness is going to play out in the Battlegrounds. There have been suggestions that people will exploit and game the system as a stepping stone to progress further in raiding. I am not taking sides in this, but so far I am reasonably happy that these issues are being watched like a hawk. Battlegrounds is a new feature launched on February 25, 2010. Battlegrounds are a Player vs. Player (PvP) environment which take place on a completely separate server from the regular PvE and PvP servers. It roughly coincided with the release of Sentinel’s Fate (Feb 16) and Game Update 55. Each of the 3 Battlegrounds have their own unique Token. These tokens can be spent at the Battlegrounds Merchant in Qeynos Harbor or North Freeport. 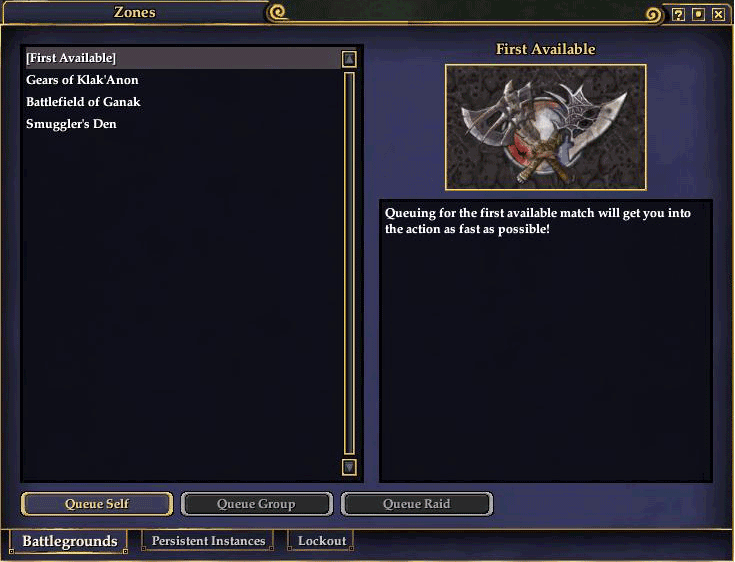 Multiple tokens from different zones are required to buy items. Just by participating in a Battleground, you will earn at least 1 token. If you are the winning team, you will earn 3 tokens. In addition, there are 2 Battlegrounds quests available for each of the 3 Battlegrounds zones. Don’t forget to pick these up before joining up! How Do I Join a Battleground? or you may choose First Available. If you are already in a group or raid, you can click Queue Group or Queue Raid to bring your pre-made group or raid over to the Battleground. Otherwise, you can click Queue Self and jump into a pickup group. When the zone becomes available, you will be prompted to join the Battleground. As soon as you accept the prompt, you are immediately logged out of your main game server and whisked away to the Battlegrounds server. Your group (or raid) is assembled on either the Red team or Blue team and off you go! You are now operating under a PvP ruleset. This can substantially change how your gear works on Battlegrounds vs. your regular server. You can look at how your gear will behave in PvP by clicking the [X] PvP checkbox on the examine window. The duration of your stun/stifle/mez/root spells is substantially reduced. And you may not use any sort of Evac/Escape ability. You may not speak to the opposing party or any other public chat such as Out-of-Character, Shout, or level chat. In Capture the Flag, you are naturally trying to bring the opposing team’s flag to your home base. To do this, you simply run up to the flag of the opposing side and your character will grab it and carry it around. You cannot score unless your team’s own flag is safe and secure in your home base. With the change to 12 vs 12, if you coordinate your strategy, you can set up a defense perimeter of 2-3 players to guard the flag, 1-2 players trying to get the flag, and then the other 7 players involved in skirmishes in the center of the playing field. The first team to successfully capture and return three flags wins. Acquire and hold the relic to accrue points faster than the opposition. The team with the higher number of points at the end of the time limit wins. Gain control of the five spires which jut out over the raging ocean and hold your position longer than the opposition! When a Battlegrounds encounter concludes (either the prerequisite number of points have been reached, or the timer runs out), all characters are teleported to their home bsae and rooted in position. A scoreboard appears show how both teams did. After approximately 30 seconds, the Battleground closes and you are returned to your place of origin. We are currently working on a complete guide to the Battlegrounds armor and weapons. 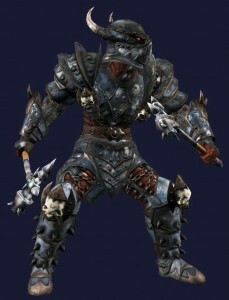 At launch, Battlegrounds is restricted to level 80-90 with Battlegrounds armor at a minimum level of 90. It is intended for Battlegrounds to have rewards added so that Battlegrounds are open to players from level 10-90. 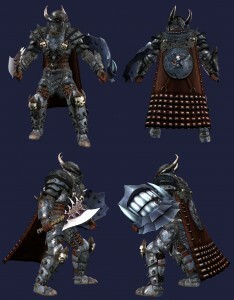 We’ve seen some screen shots on the web of the Battlegrounds armor, but it’s been pretty low quality images. We took some images with the maximum graphic settings. 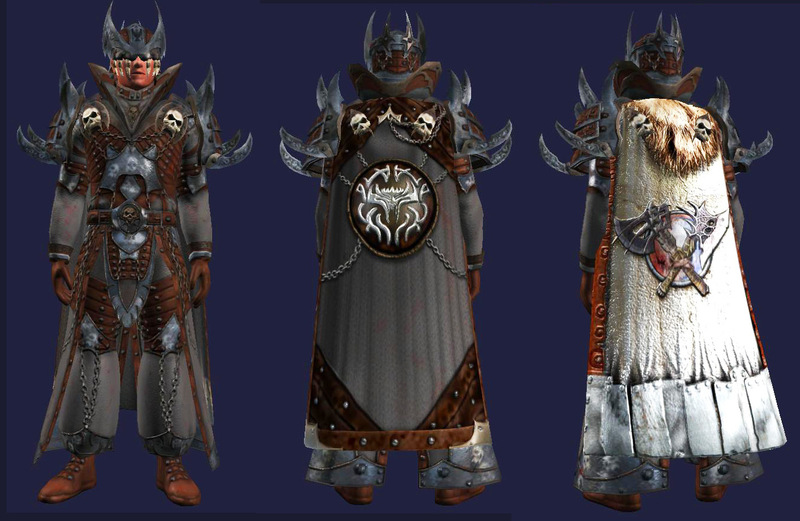 This is the most detailed armor EQ2 has seen yet! One surprising aspect of the Battlegrounds is that each of the 3 Battlegrounds zones give different tokens. The Battlegrounds merchants (now parked in Qeynos Harbor and North Freeport) require 30-40 tokens from at least TWO different zones to buy each item. Battlegrounds are up on Test and Test-Copy!! Teams who win their matches between 5 and 8pm PST every day that the BG’s are up for testing will get an awesome battlegrounds cloak for their characters! As a special Battlegrounds event, several members of the SOE staff will be available for match-ups on Thursday, February 11th from 4 until 6pm PST. Our SOE teams will play anyone who wants to challenge us and (if you beat us!) the winners will receive a special in-game title after the event! So make sure you head on over to Test and Test-Copy to practice and we’ll see you Thursday!! Battlegrounds have been activated on the Test Copy server and we’d like to see people starting to join as soon as possible. We will be re-enabling the /testcopy command today, so if you aren’t on this server, go ahead and queue yourself up. We expect a lot of people requesting a copy, so it might take a little time to get everyone moved over. Expect bugs and expect crashes so if you notice something out-of-place please report it to us using the /bug or /feedback command. To access battlegrounds, press Alt-Z (the old Zone Reuse window). The first tab should allow you to select a match and queue yourself or your group. 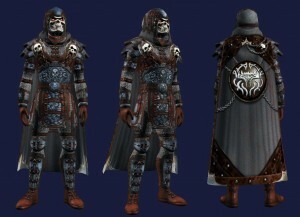 Battlegrounds Discussion on EQ2 Forums! NOTE: Some players are reporting crashes with EQ2Maps and Battlegrounds. For the time being you may need to uninstall EQ2Maps and use the default UI. So far, we’ve spotted a dozen individuals who seem particularly interested in player’s triumphs and exploits in the Battlegrounds. Each camp offers 2 different quests for their Battlegrounds zone — defeat other players, or complete the scenario. Qeynos Harbor seems to be the quest hub for good characters wishing to participate in Battlegrounds. Those of the evil persuasion can find these tasks in North Freeport. 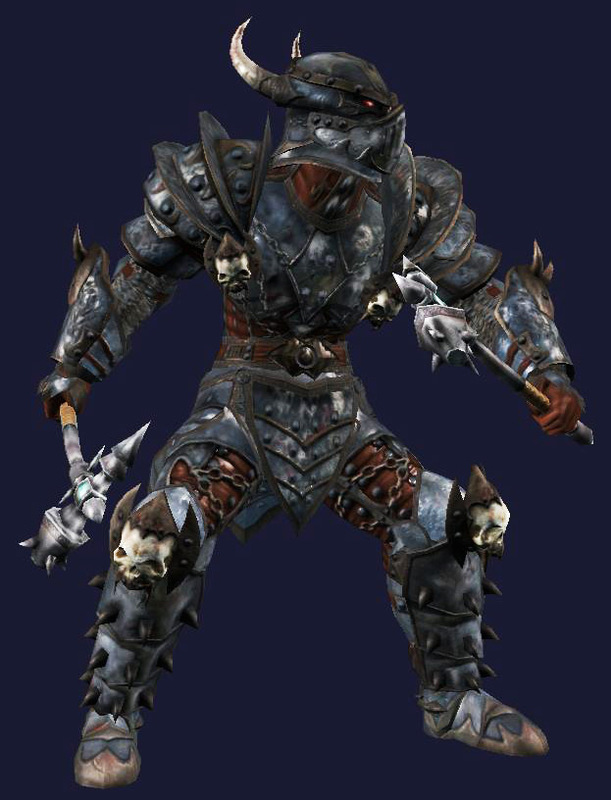 Calthine of EQ2 ZAM is reporting that Battlegrounds are now on the Test Copy server. Note: There is currently an issue preventing people from being pulled into the Battlegrounds interface when clicking the “Queue” button. Devs are on the case.